An international film selection committee has chosen not just one but two films from the Philippines that will represent to the upcoming Toronto International Film Festival (TIFF 2015). While the other film has proven its strength by becoming the runaway winner to the SinagMaynila Film Festival 2015, the other film has yet to be proven its worth due to the recent snubbing incident to the upcoming Metro Manila Film Festival (MMFF 2015). However, because of the latter's film director and main actor's backgrounds to their respective artistic crafts, this movie is set to blow the movie houses down with its controversial plot and story. "Imbisibol" starring JM de Guzman, Ces Quesada, Bernardo Bernardo, etc. and directed by Lawrence Fajardo, and "Honor Thy Father" starring John Lloyd Cruz and Meryl Soriano, directed by Erik Matti, have finally made it to the final cut of the official selection to the TIFF2016. *See the official list of SinagMaynila Film Festival 2015 here. The movie "Imbisibol" (Invisible) is a movie adaptation of the one-act play of one of today's promising playwright and screenwriter, Herlyn Alegre. The movie version of "Imbisibol" follows the lives of Rodel (JM De Guzman) and three other Filipino migrant workers in Japan namely Linda (Ces Quesada), Benjie (Allen Dizon), and Manuel (Bernardo Bernardo) whose lives intertwined amidst their struggling individual lives as undocumented Filipino workers who are suddenly caught together in a game of hide and seek in a foreign country. "Imbisibol" is directed by Lawrence Fajardo and the runaway winner to the Sinag Maynila Independent Film Festival 2015. Below is the movie trailer for "Imbisibol". *From Stage Play to the Big Screen, follow "Imbisibol's" journey here. 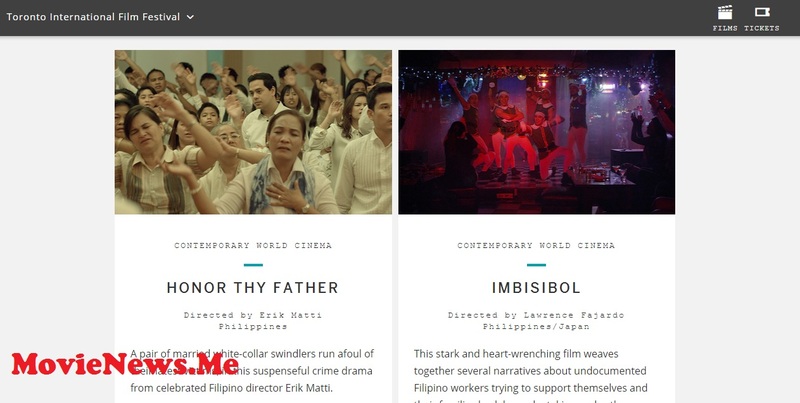 Even though Erik Matti's film masterpiece did not make it to the movie line up in this year's MMFF 2015, "Honor Thy Father" (Conman) was also chosen as one of the two representatives of the Philippines to the Toronto International Film Festival 2015 happening this September 10 to 20, 2015 in Toronto, Canada. Erik Matti's last real-life action-drama movie was the 2013 big hit action movie, "On The Job (OTJ)" starring Piolo Pascual, Gerald Anderson, Joey Marquez, and Joel Torre. Director Erik Matti is also known as the director of the Aswang Chronicles movie, "Tik-Tik" and "Kubot" and is said to be the next director who will handle a big Philippine superhero movie project series! *Here are the official movie entries to the MMFF 2015. Meanwhile, one of Philippines' finest actors, John Lloyd Cruz plays the lead role in this upcoming film together with Meryl Soriano as the notorious white-collar swindler couple who run afoul of their latest victims in this eventful, suspense-action-drama movie. Another masterpiece to watch out for from the celebrated movie director, Erik Matti. Watch the "Honor Thy Father" (Conman) movie trailer below. The Toronto International Film Festival 2015 is happening on September 10 to 20, 2015 in Toronto, Canada. For more information on the ticket sales or schedules of screening, you may log on to http://tiff.net/ for details.